It feels weird to write a story about nothing happening, but after recent events it seems important—criticism where necessary, but credit where it's due. 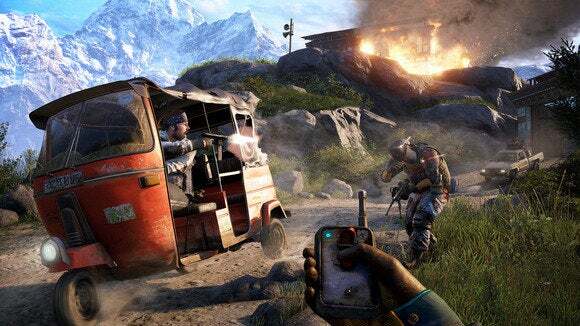 I went into Far Cry 4 with a fair bit of trepidation after last week's disastrous Assassin's Creed: Unity launch, especially since Ubisoft wasn't handing out Far Cry 4 review codes to PC sites. It seemed like it could be a sign of bad things to come. Fortunately, it wasn't. The PC version of Far Cry 4 isn't going to blow your mind and set new standards by which ports should be judged, but it's competent. That is to say, Far Cry 4 is definitely a game designed with consoles in mind and not much is added to make the PC version stand out, but at least the game (in the three hours I've played) looks gorgeous, runs at a steady 60+ frame rate, and doesn't crash once per hour. If you saw pre-release footage and thought "Well hey, that looks like Far Cry 3 but set in East Asia," you thought correctly. I've had one minor bug—changing the field of view to maximum made it appear like my character was riding in the back seat of a car instead of the front passenger seat. Other than that, however, this seems like a stable and gorgeous PC port-job. Looking around on the Internet, the consensus seems to match my own (brief) time with the game. I'm not seeing widespread reports of problems, which I'm going to take as a good sign—Unity fans were pretty outspoken last week about the game's issues within hours of launch. If we do hear anything, however, we'll be sure to update you. Fingers crossed. As for the story and the rest, we'll have a review up later this week as soon as I've finished climbing towers and filling animals full of arrows.